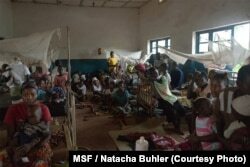 Two children stricken down with malaria rest at the local hospital in the small village of Walikale, Congo. 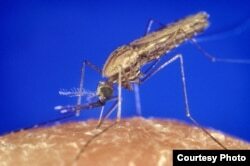 Two vaccines developed by a Maryland company are showing promise in the fight against malaria. One vaccine was 100 percent effective in preventing the deadly disease malaria. That is according to the biotech company Sanaria Inc. of Rockville, Maryland that developed the vaccines. Malaria is a disease caused by parasites and carried by mosquitoes. Parasites are organisms that live on or in an organism of another species and feed off it or get protection from it. Mosquitos spread the disease to people by biting on their skin. The World Health Organization says there are 214 million cases of malaria each year. And the deadly disease kills over 400,000 people a year worldwide. People who have malaria often have fever, chills, and flu-like illness. Serious complications happen, including death, when the disease is left untreated. An unidetified mother as watches over her child who is suffering from severe malaria, as other children lay nearby, in the Siaya hospital in Western Kenya. Photo taken on Oct. 30, 2009. The new vaccines work by preparing the immune system to fight the disease. They do this by introducing live, but weakened, young parasites called sporozoites. They are injected into the body by infected mosquitoes. Both vaccines target Plasmodium Falciparum, which is the most common and deadly form of the disease. The more successful of the two trials was carried out in Germany. Different doses, or amounts, of the vaccine were injected into 27 healthy people who volunteered for the study. Another group of 15 was given a placebo, which is a substance given to a patient like a drug, but it has no physical effect on the person. Eight to 10 weeks after the last vaccine dose, both groups were then exposed to the parasites that carried the malaria. Stephen Hoffman is chief executive and scientific officer of Sanaria. He says the researchers were surprised by the results from nine of the people who received the highest vaccine dose. "We got 100% protection against malaria at ten weeks, two-and-a-half weeks after the last dose of the vaccine. That is really beginning to look like something quite extraordinary and that's never been done before." A second trial involving another sporozoite vaccine was carried out in Mali. It tested whether the vaccine prevented reinfection in the people already exposed to malaria. More than half—66 percent—of those who got the vaccine dose became re-infected with malaria within six months after they were vaccinated. For the people in the placebo group, those who did not get any healing treatment, the number was higher. Ninety-three percent of the people who were in the placebo group were re-infected. While 66 percent is not the best number the researchers would have hoped for, Hoffman calls the results a good first step. "This is the highest level of efficacy against malaria infection ever seen in a vaccine trial in Africa." The results of that trial were reported at the same time in the journal The Lancet Infectious Diseases. Hoffman thinks Sanaria vaccines show more promise than others because they use the whole sporozoite to help the immune system. He says other vaccine makers only use a small part of P. falciparum to try to get a good immune response against the malaria parasite. He believes this is not as effective as his idea of using the whole sporozoite. Sanaria plans more clinical trials of both vaccines throughout Africa, including in Mali, Burkina Faso, Kenya, Equitorial Guinea and Tanzania. "For us, our raison d'etre [reason to be] for Sanaria is to develop a vaccine that can be used in what we call mass vaccination campaigns to immunize the entire population in a geographically defined area so that one can halt transmission and eliminate the parasite." The vaccine news comes after a recent study says there are now malaria “superbugs” emerging in Southeast Asia. Researchers reporting in the journal The Lancet Infectious Diseases found that a kind of the P. falciparum parasite—the one being used for the vaccines by Sanaria-- is now becoming resistant to the most effective malaria drug. They say the resistance is spreading. 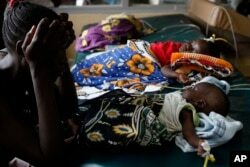 135 children hospitalized in the children's ward of Pawa General Hospital, most of them for severe malaria. Photo taken on May 9, 2016. Many people would benefit if they are successful, but those who would benefit the most are children in Africa. The U.S. Centers for Disease Control and Prevention says most of the people who die from malaria are children in the African Region. It says most of the cases in the United States are in travelers and immigrants coming to the U.S. from countries where malaria is present—including many from sub-Saharan Africa and South Asia. Jessica Berman reported this story for VOA News. Anne Ball adapted the story for Learning English. Hai Do was the editor. We want to hear from you. Write to us in the Comments Section and visit us on our Facebook page. See how well you understand the story by taking this listening quiz. Play the video, then choose the best answer.